This book is on my Fall Reading Challenge List. I wanted to read it after having read Washington's Lady and Just Jane. 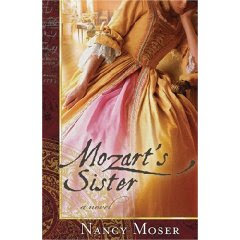 I didn't like Mozart's Sister very much but that has nothing whatsoever to do with Moser's writing style and everything to do with the fact that I thought Mozart's sister lead a very depressing life. Moser even focused on the positives but all I heard were the negatives. First of all, Mozart's sister was named Nannerl which is a dark enough beginning as it is. Next, she spent her whole life being dutiful and obedient to her parents and everyone to the point of not really living. She was in the shadow of a spoiled rotten brat (with respect to my husband who loves classical music). I really can't stand Mozart after having seen the movie Amadeus and after reading this book (and little other "research" besides). I cannot abide the thought of living my life thinking someone who thought only of himself was to be respected. I do not possess any respect for "Wolfie" no matter WHAT his talents. Talent is no excuse for bad behavior and it is a poor excuse for bad parenting. Intolerable. And this is what Nannerl seemed destined to live under -- bad parents and an unbearable sibling. Yet - she enjoyed music too. She loved her parents. She was proud of her brother and understood him (at least at times). She carried the family cross and shame of his sometimes scandelous behavior, married a man she didn't love out of duty and obligation and even gave up the rights to raising her own child so as to bless her father with a relationship he craved having with his grandson. Really, she's unbelievable. I'm not sure whether I would admire or despise her. Moser gives the disclaimer, as she always does, that she is not a historian. She is a novelist. This book reads like one. However, she does do her research in creating her characters and making historical figures come to life. She certainly made the Mozart family live in my mind. I just don't necessarily like them. But that should not take away from the book. In fact, I'd say that good writing (or entertaining writing!) wouldn't let me walk away from the family. Rather, her style continues to draw me in and make me always realize how little I know about life itself. That's actually a good thing. So I promote the book, if not the main character. Read it for yourself and form your own conclusions. Interesting review. It's made me think about reading books by Nancy Moser and even this one! Thanks for the review! I really enjoyed it! Now I'm totally curious about the life of Mozart and his family. I'll definitely be adding it to my list of books to read in the future. This one looks good. I've added it to my reading list. It definitely sparked my curiosity! Thanks for the review. I'm adding it to my check out list. Thanks for the review. This really looks like something I want to check out. Thanks for posting an excellent review.